for The Atlantic for more than three years now, traveling the country by plane to report on how America is rebuilding itself through interesting cities and towns. Those who attended The Jefferson's July 18 evening lecture will rememberDeborah. Deb presented: "Not Your Mother's Library: How America's Public Libraries are Reinventing Themselves for the 21st Century" -- a topic she's reported on for The Atlantic before. 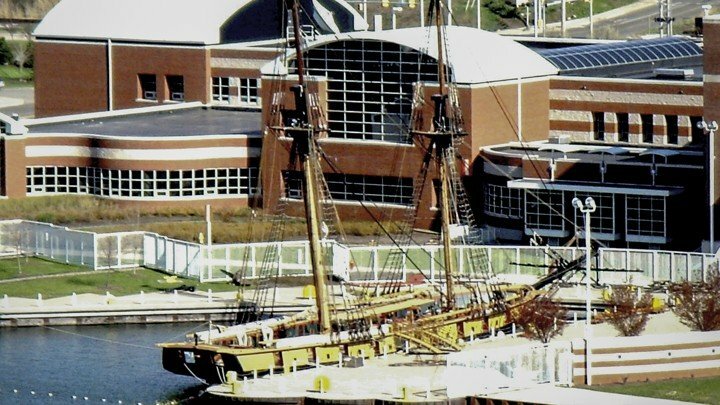 Last week, Deb put Erie's library in the national spotlight, posting: "A Waterfront Library: In Erie, Pennsylvania, a public institution is building on its nautical past to open a world of opportunity for local residents." Deb discusses how the library made the move from downtown Erie to the waterfront and how it's since become an anchor in the area. She writes about current programs and explores what's on the horizon, as the library continues to evolve in the 21st century. To read the full feature, in which she quotes 2015 Erie County Civic Leadership Academy graduate Erin Wincek, who says the library is working to "inspire ideas that will change the direction of people's lives," click here. On Sunday, Sept. 11, James Fallows turned his attention to ECGRA -- Erie County's Gaming Revenue Authority. In Erie's Unlikely Benefactor: Its Casino, James acknowledges how legalized gaming is "a familiar part of the modern American landscape," but tells of how "an innovative scheme in a lakeside city in western Pennsylvania shows new possibilities for putting casino revenue to positive public use." He goes on to add: "What is notable in Erie's case is the way the community has decided to use its share of the casino revenues. It's different from what we've seen any place else, and I think it deserves attention." To read the attention he's paid ECGRA and the work its Executive Director Perry Wood is doing, click here. Prior in their coverage, Deb authored: "'America is a Dream Country'," a captivating and insightful look at refugees in Erie. In it, she tells the story of Mohammad Zkrit, who, along with his wife and four children, arrived in Erie early June. The Zkrit family was living in Aleppo, Syria until their neighborhood was bombed. His house destroyed and suffering injuries from the bombing, Mohammad gathered his family and fled to a camp in Lebanon. From there, the family moved to Jordan and applied to the United Nations High Commissioner for Refugees to obtain refugee status. After three years in Jordan, they were approved and boarded a plane destined for the United States, ultimately leading them to Erie, Pa.
To read the whole story, including how the family -- like many other refugees -- has received support from the U.S. Committee for Refugees and Immigrants (International Institute of Erie), click here. The Fallows began their coverage with James' feature, "Erie's New American Dream," in which he writes about Erie's economic climate, its New American population, its education challenges, tourism, self-image, general split, and more. He also mentions one of our Jefferson Essays, authored by Jim Wertz and Perry Wood, on Erie's Advanced Industries, and cites a recent feature by our Program Director Ben Speggen in the Erie Reader on innovation and advanced manufacturing in Erie. As the Fallows continue their coverage of Erie, we'll continue sharing the updates with you, because if you're like us, you're proud of Erie's accomplishments and are excited to see its story being told on the national level. In case you've missed it, Erie, Pennsylvania has become the focus of two of The Atlantic's national correspondents. Husband and wife James and Deborah Fallows have been working on the City Makers: American Futures project for The Atlantic for more than three years now, traveling the country by plane to report on how America is rebuilding itself through interesting cities and towns.